10ml of original 20% Entourage Oil… which contains 2000mg of CBD and CBDa. That’s it. No other changes have been made. It’s otherwise exactly the same as it was. WHAT IS THE 2000MG ENTOURAGE OIL SPRAY? The 2000mg Entourage Oil Spray is our replacement for the 20% Entourage Oil. It contains exactly the same amount of CBD as the 20% Entourage Oil. That’s it. No other changes at all. It’s otherwise exactly the same as it was. 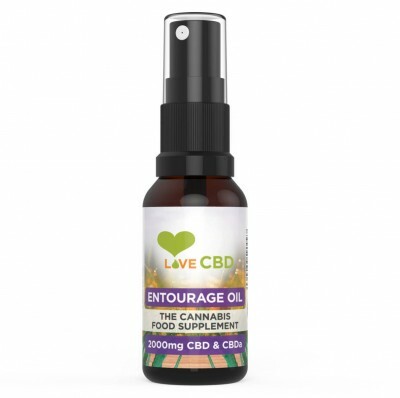 The Entourage Oil contains a full array of cannabinoids, including CBD, CBDA and CBG. It also contains a large number of terpenes. Terpenes are the compounds in cannabis that cause the famous cannabis aroma: they’re basically cannabis essential oil. Due to ever-more sophisticated extraction techniques, The Entourage Oil now has more terpenes than ever before. Among the terpenes present are Myrcene, Limonene, Alpha-Pinene and – most importantly – Beta-Caryophyllene (BCP). BCP is by far the most common terpene in The Entourage Oil. It is what causes the subtle pepper taste you might have noticed. It is also a cannabinoid, which is of maximum interest to us. We consider BCP an important layer in the Entourage Oil. 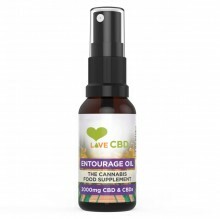 Click the button below to add the Love CBD 2000mg Entourage CBD Oil Spray 20ml to your wish list.